One of the greatest calamities for a girl is to have a brick red and painful pimple right in the middle of her beautiful face! God forbid if it occurs before an important event like a marriage ceremony, interview or date then we’re doomed. Here we will brief you with five lifestyle changing habits which help you avoid pimples, as much as it can. Follow them strictly with full self-control. 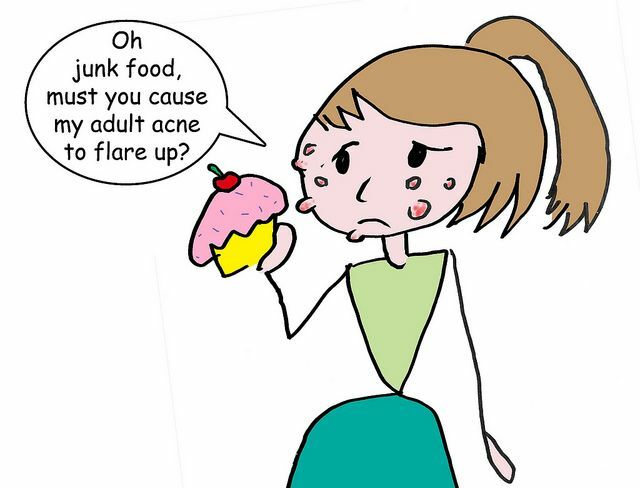 1.Eat right- junk food is one of the biggest reasons why acne occurs. Do not eat a lot of deep fried food, especially in restaurants or fast food joints. We can never be too sure about the preparation of outside food. 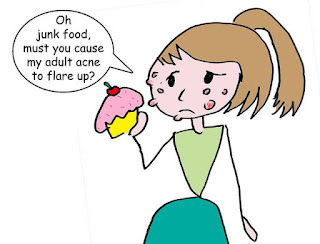 Street food and that too fried is a strict no if you want acne to stay away from you. Home food is best; even if you chose outside food, opt for something that is not fried or high on trans-fats. Eat more of fresh fruits and vegetables, as much as possible. 2.Exercise-along with eating right it is also important to exercise. Excess of fat, sugar, salt and cholesterol also shows on the face and body in the form of acne and pimples. It is important to exercise daily and burn some fat, sweat is body’s way of releasing extra salts, sweating is a natural process of body cleansing. Daily heavy sweating, due to exercise makes your skin glow. So make it a point to exercise/jog/walk daily for a minimum of half an hour. 3. Be hygienic- make sure your hands are clean and germ free every time you are about to eat. Just using a sanitizer is not enough because it only kills the germs but does not remove them from your hands. The dead germs are still there! Therefore you should make it a point to wash hands before eating; otherwise it may lead to some infection which might result in acne. Bath regularly, keep your face and body clean. Always remove make-up before going to bed; also do not apply access of make- up that also irritates the skin. 4.No more popping pimples! - Acne scars are difficult to get rid of, if you pop those pimples on your face, you are inviting permanent scars. You might feel intense satisfaction by popping that rotten, big pimple on your face, but that always harms you more than it helps you. Plus our hands come in contact with lot of people and places and are always having germs on them, it is best to keep your hands away from your face as these germs might cause further infection and acne. 5.No stress! - don’t stress yourself with anything, firstly because that is never a solution, in fact it prevents you from thinking right, and secondly, stress also causes pimples. Keep your calm, take proper rest, have peaceful naps and everything will be fine. Remember taking tension will never solve any problem, it will make it worse. Lastly, these tips are life hacks, they not only help you avoid pimples but a lot of other health related problems as well. If you eat right, sleep right, exercise, keep clean and maintain your hygiene, half of your problems are sorted anyway!